As you may have noticed the other day, we are crazy people who allow toddlers to eat & drink in the car. Not all of the time, and it’s usually limited to water and a dry snack like animal crackers. However, when your 2.5 year old is crying because she doesn’t want to leave an open house at her preschool (how sweet is that? ), you do what it takes to put a smile back on her face. Chloe is usually pretty clean in the car, but there always comes the day when it’s really time to deep-clean the carseats (and we were over-due after a fun summer). I’d been putting it off because the thought of it intimidated me. 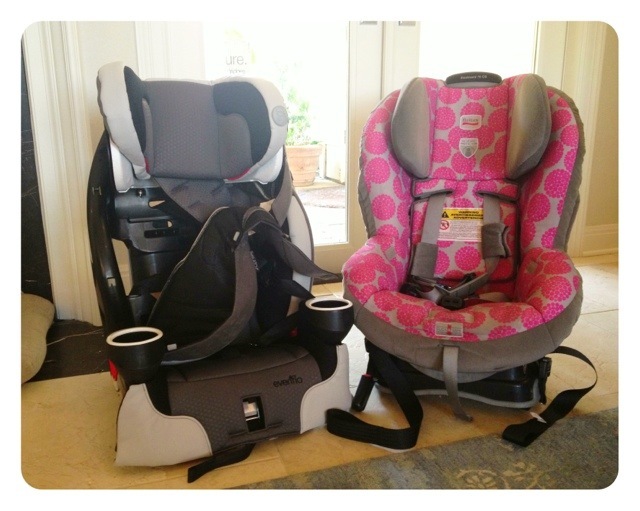 We have an Evenflo SecureKid 400 & Britax Boulevard 70-CS (discontinued, similar here) for reference, but it really just takes some common sense (and maybe a manual if you have one handy). This was much less painless that I imagined it would be. I started at the outside edges. It was pretty easy to figure out how it was attached and remove it. That made it obvious that the headrest covers needed to be removed first, and they came off easily on both brands. I had to disconnect the straps on the back of the Evenflo, but it was super easy and something I needed to learn how to do anyway since they need to be moved for larger children. Then it was just a matter of pulling the straps through and off the covers came. The Britax had an extra, loose foam pad that I washed separately in the sink with dish-soap and left air dry. I put the covers in the washing machine and let it take it from there. I vacuumed every nook and cranny to get all of the dropped snacks and crumbs out. Then I cleaned the straps with household cleaning wipes. I’ve heard of these being removed and washed in the sink or washing machine, but they cleaned up pretty well for me with just the wipes. I also used the wipes to clean the plastic and bottom side. Yay! 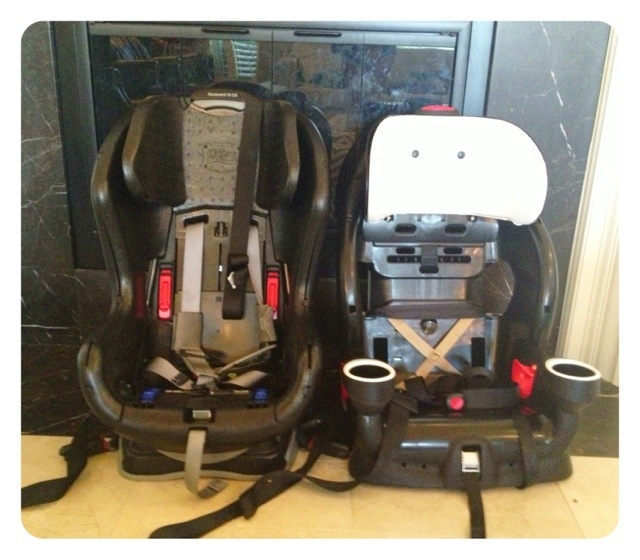 2 clean carseat shells! Reassembly was easy, too. 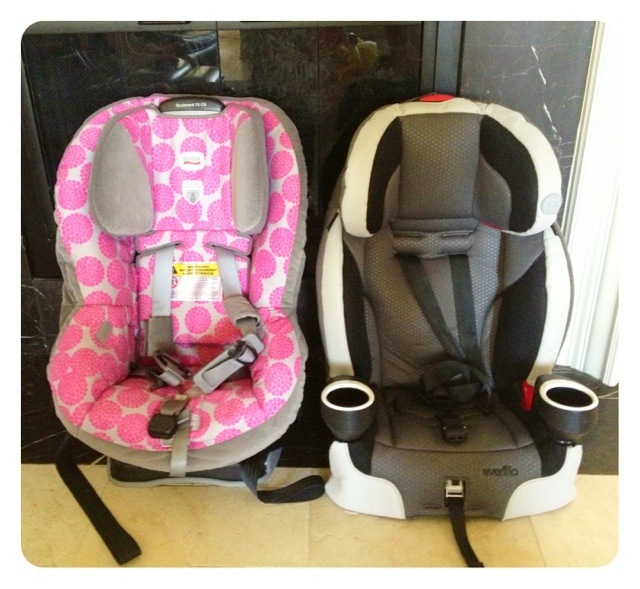 Once dry, my newly re-britened carseat covers went right back on without any trouble. Seriously what took me so long to get to this? Now is a great time for some fall-cleaning, even in the car. Do it now while the “back-to-school” energy is still in the air and hopefully it will be as painless for you as it was for me. Just be careful cleaning the straps. Newer models have fire retardant coating. They advise not washing them. But I think a mild wipe down should be fine. Looks good!